We all know that some people fall into a certain category of person. These people are sore losers (or sore winners), and they generally try to hound you no matter how much you try to avoid them. They're always talking about themselves and never ask about you, or they insist on telling you how awesome they are. Instead of talking about themselves, they might just constantly critique your work, especially when you want their opinions the least. These people have a name. That name is "jerk." More accurately, they might not be jerks, but their actions are often that of jerkiness. Whether they try to bring you down or are trying to bring themselves up, they are generally unpleasant to be around. Either way (or even if they reek of some other sort of personality disorder like just being a rude asshat), we're going to call them jerks for now and move forward. 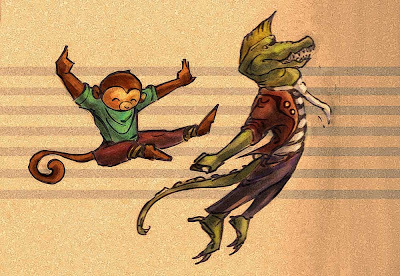 So Monkey + Seal have a rule: it's called the "No Jerk Rule." We actually call it the "No A-hole Rule," but for pleasantry's sake, let's go with jerks. Basically, we refuse to work with jerks. While it is a lot more difficult to start out following this rule when you're starting out, we've found that it's a great guiding principle for our business. If the jerk is a client, we'll politely and professionally end the relationship. If it's a collaborator, we'll politely and professionally leave the project. No matter how it works - no jerks. We do realize that at times there are people who seem nice at first and turn into jerks as you begin to work with them. Also, you can be contractually obligated to work with people and you can't back out lest some sort of huge financial obligation. There are many circumstances, but there are ways that sometimes you can get stuck with jerks. How to deal with them? The Jerk Fee. If you are working with a client who you know is going to be troublesome from the get-go, the best way to deal with them is to basically apply a Jerk Fee. Whatever that fee is, you want to make sure that it's enough for you to feel okay about dealing with this person. This is why for design work you should always limit the number of revisions your client gets for free. The jerks are going to be the one who will make you change a color, then change it back, then add some new text that will completely change the layout, then have you change it back to a new color and remove all the first changes...etc. etc. etc. By basically giving them a free proof or two, but then charging them for each revision, people usually limit their changes after that. If you're working with a client who refuses to get you assets on time, start charging them a fee for every day late that they turn it in. Your friend of a friend not paying you for that CD cover that you delivered a month ago? Let them know that in your contract, you stipulated payment in full within 7 days of receipt and they you're charging them 10% per day, interest compounding, after each day thereafter. If you couldn't tell, Monkey + Seal have found that contracts are our best friends. Even for little jobs for friends, signing contracts is important as you can legally bind these people to agree to your Jerk Fees. If they are going to make your life as an artist more difficult, you should be compensated for it, and by putting that in writing, it makes people generally a lot more civil and easier to work with. Alternatively, if your boss is a jerk, we recommend that you start looking for a new job, ASAP. While there is a myth that everyone hates their boss, it is just that: a myth, so do your best to try and find good bosses. You can have really cool bosses (yes, they do exist!). We don't advise just quitting your job without a backup unless the abuse is too much to handle, and at that point, there are probably other recourses you can take like harassment suits or talking to HR. The other option to quitting a toxic job is to start up your own business on the side. Want to quit your day job? Start the hustle. Find ways to sell your art. Write an e-book. Auction your paintings off on eBay. Get that portfolio together and start submitting it wherever you can. Figure out what skills you have that people will pay for and get out there and find a way to make other sources of income. Escape the jerkdom! The one caveat to the "No Jerk Rule" is that you have to act like everyone else has this rule as well. You gotta make sure that you are acting professionally and with integrity as well. Be the artist that YOU would want to work with. All in all, the reason we really want to encourage people to take up the "No Jerk Rule" is because when it really comes down with it, no one should have to put up with bad behavior. You're an awesome, amazing person, and you deserve much better.